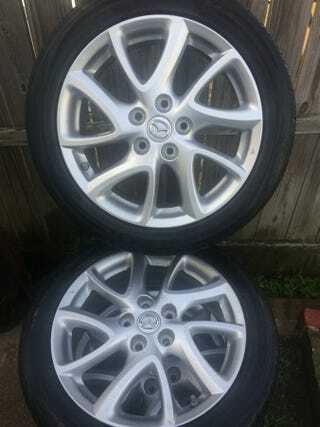 Pulled from a 2012 Mazda5, same year and model as I have, but these are the larger 17 inchers, and they’re for sale just a few miles away from me. I’m not sure how much tread is left and if the TPMS sensors are still there - I’ll have to contact them to find out. I’ll also need to find out if these tires are 5 years old or if they’re newer. They’re asking $500 for the set, which is a bit more than I’m interested in paying, but they have been listed for several weeks now so I might be able to talk them down a tad. I’ll need to find out what would be considered a reasonable price. They’re not the Mazda6 wheels I wanted, but I know that they’ll fit on my car without issues, so that piece of mind has to be worth a little something.